This, in the NYTs article which my co-blogger Theophrastus links to in his post here. 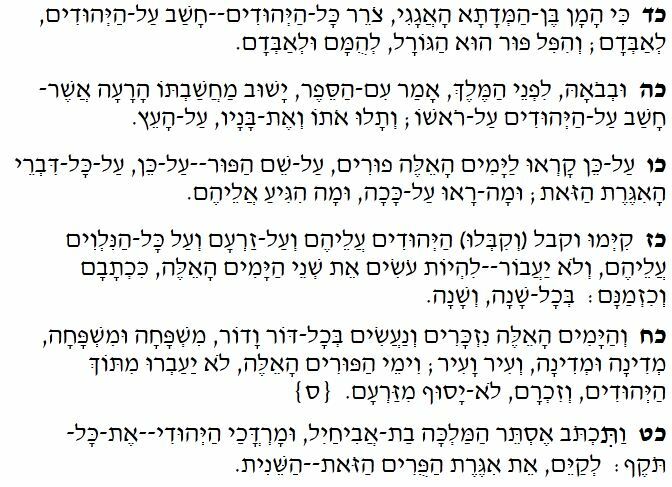 Which makes us all wonder what the Jewish community in Alexandria must have been thinking when Esther was translated into Alexander the Great’s language. That’s right, the Alexander from Macedonia. That’s right, the goyish Greek language. 24 Haman son of Hammedatha the Agagite, the enemy of all the Jews, had plotted against the Jews to destroy them, and had cast Pur—that is “the lot”—to crush and destroy them; 25 but when Esther came before the king, he gave orders in writing that the wicked plot that he had devised against the Jews should come upon his own head, and that he and his sons should be hanged on the gallows. 26 Therefore these days are called Purim, from the word Pur. Thus because of all that was written in this letter, and of what they had faced in this matter, and of what had happened to them, 27 the Jews established and accepted as a custom for themselves and their descendants and all who joined them, that without fail they would continue to observe these two days every year, as it was written and at the time appointed. 28 These days should be remembered and kept throughout every generation, in every family, province, and city; and these days of Purim should never fall into disuse among the Jews, nor should the commemoration of these days cease among their descendants. 29 Queen Esther daughter of Abihail, along with the Jew Mordecai, gave full written authority, confirming this second letter about Purim. 23 So the Jews accepted what Mordecai had written to them 24 —how Haman son of Hammedatha, the Macedonian, fought against them, how he made a decree and cast lots to destroy them, 25 and how he went in to the king, telling him to hang Mordecai; but the wicked plot he had devised against the Jews came back upon himself, and he and his sons were hanged. 26 Therefore these days were called “Purim,” because of the lots (for in their language this is the word that means “lots”). And so, because of what was written in this letter, and because of what they had experienced in this affair and what had befallen them, Mordecai established this festival, 27 and the Jews took upon themselves, upon their descendants, and upon all who would join them, to observe it without fail. These days of Purim should be a memorial and kept from generation to generation, in every city, family, and country. 28 These days of Purim were to be observed for all time, and the commemoration of them was never to cease among their descendants. 29 Then Queen Esther daughter of Aminadab along with Mordecai the Jew wrote down what they had done, and gave full authority to the letter about Purim. This is no mere “addition” to the whole Megillah, to the Book of Esther, either. How happy is Purim for all (except for some). Well, Haman is also called a “Bougaean” in both the Old Greek and Alpha Text. I really recommend Berlin’s account which focuses on similarities between (mainly Hebrew) Esther and Greek comedy. Many people, the more they are honored with the most generous kindness of their benefactors, the more proud do they become…. But, unable to restrain his arrogance, he undertook to deprive us of our kingdom and our life… He thought that by these methods he would catch us undefended and would transfer the kingdom of the Persians to the Macedonians. It was in fact at this time that Alexander gave loose rein to his passions, and changed continence and self-control, eminent virtues in every exalted fortune, to haughtiness and wantonness. Regarding his native customs and the discipline of the Macedonian kings, wholesomely restrained and democratic, as too low for his grandeur, he strove to rival the loftiness of the Persian court, equal to the power of the gods; he demanded that the victors over so many nations in paying their respects to him should prostrate themselves upon the ground, and gradually sought to accustom them to servile duties and to treat them like captives. Accordingly, he encircled his brow with a purple diadem, variegated with white such as Darius had worn, and assumed the Persian garb.… In fact, he used to say that he was wearing the spoils of the Persians; but with them he had assumed also their customs, and insolence of spirit accompanied the magnificence of his attire. The letters also which were to be sent to Europe he sealed with the device of his former ring; on those which he wrote to Asia, the ring of Darius was impressed.… Three hundred and sixty-five concubines, the same number that Darius had had, filled his palace, attended by herds of eunuchs, also accustomed to prostitute themselves. “My friends from Persia,” Amyntas replied, “that is not the way we do things here: we keep men and women separate. But since you are our masters, if that’s what you want, you shall have it.” And with these words Amyntas sent for the women. The women came in response to his summons and sat in a row opposite the Persians. When the Persians saw how beautiful the women were they told Amyntas that what he had done was quite stupid; it would have been better, they said, for the women not to have come in the first place than to come and not sit next to them, but opposite them where they were a torment to the eyes. Amyntas had no choice but to tell the women to go and sit next to the Persians. As soon as the women did so, the Persians, who were exceedingly drunk, began to touch their breasts, and one or another of them would even try to embrace them. As you recall, later, Amyntas’s son gets revenge on the Persians, by substituting smooth-chinned Macenonian warriors dressed in drag with hidden daggers, who assassinate the Persians as soon as they begin their fondling. You can see here Herodotus’s double prejudice: he regards the Persians both as decadent and as country bumpkins (unable to distinguish between women and men dressed as women).